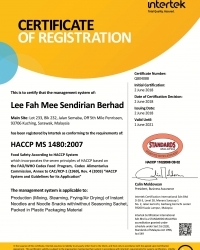 Hazard Analysis and Critical Control Points (HACCP) MS 1480:2007 certifications awarded to Lee Fah Mee Sdn Bhd by Moody International. 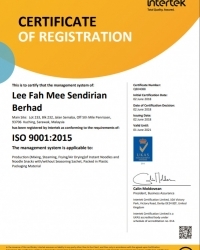 HACCP ISO 9001: 2015 certifications awarded to Lee Fah Mee Sdn Bhd by Moody International. 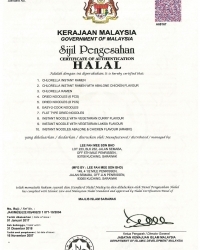 HALAL certificate awarded to Lee Fah Mee Sdn. Bhd. by Sarawak Islamic Council, Malaysia. 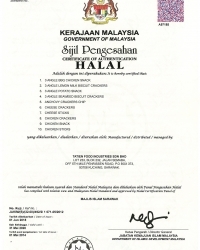 HALAL certificate awarded to Tatien Food Industries Sdn Bhd by Sarawak Islamic Council, Malaysia. 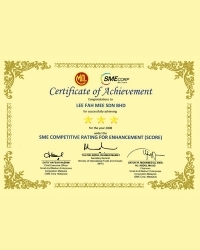 SIRIM quality standard certificate awarded to Lee Fah Mee Sdn Bhd. 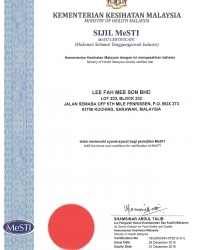 MESTI food safety certificate awarded to Lee Fah Mee Sdn Bhd by the Ministry of Health Malaysia. 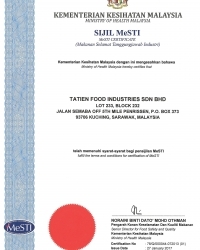 MESTI food safety certificate awarded to Tatien Food Industries Sdn Bhd by the Ministry of Health Malaysia. 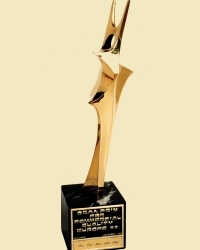 SME Award for SME Competitive Rating for Enhancement (SCORE 4 Stars). 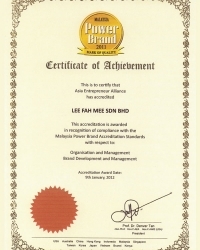 Power Brand 2011 certificate awarded to Lee Fah Mee Sdn Bhd. 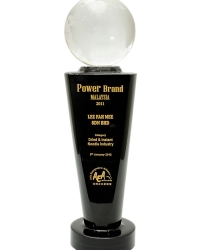 Power Brand 2011 trophy awarded to Lee Fah Mee Sdn Bhd. Sarawak Chief Minister’s Award for Excellence in Management. Lee Fah Mee Sdn. 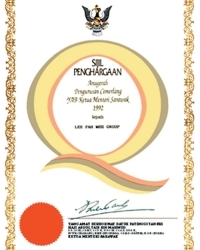 Bhd is the second instant noodle manufacturer in Malaysia being awarded SIRIM standard certification in 1983. Both Lee Fah Mee Sdn. Bhd and Tatien Food Industries Sdn. 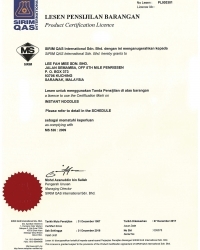 Bhd have obtained official HALAL certifications from Islamic Affairs Division of the Prime Minister’s Department Malaysia since 1996. 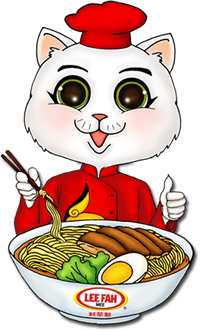 Being an established food manufacturer for more than four decades, Lee Fah Mee Sdn. Bhd achieved many awards for their excellence in product quality, management and contributions to the society. The Sarawak Steamship Co Bhd was awarded 100 years of Excellence Award. 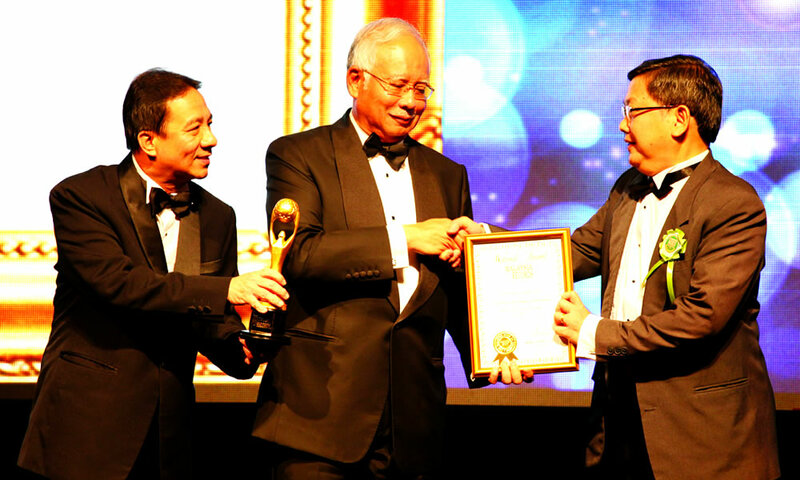 The award was presented by YAB Dato’ Sri Mohd Najib Tun Abdul Razak, the Prime Minister of Malaysia in Kuala Lumpur.